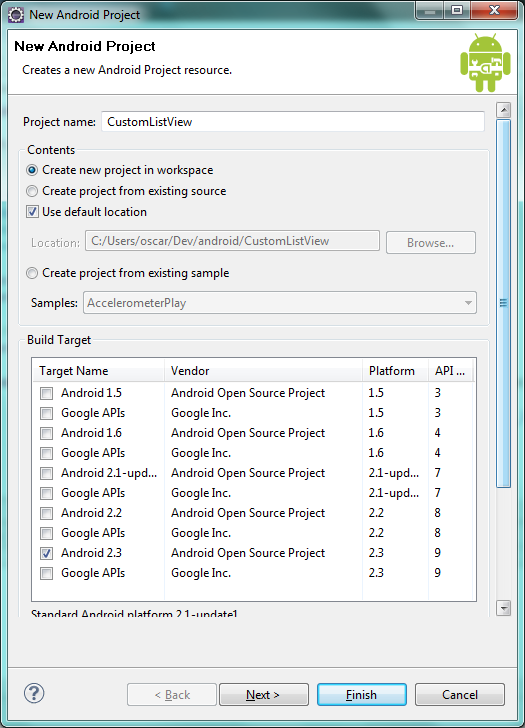 This document describes how to build a custom list view in Android. In this case, 2 rows and 1 image will be displayed in the list view. It is assumed that the reader has basic knowledge on the Android OS. 1.2) You can put any name for the project, in my case, I called it CustomListView. The android version specified is 2.3, but the code should work correctly on earlier versions. 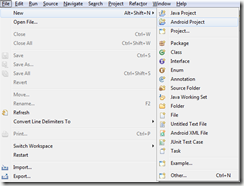 In the “Properties” section, you must provide the application name, package name and the activity name. These fields were filled out as follows: Custom ListView, com.customlv.test, LVMain. getCount: returns the total number of items listed. getItem: returns an item based on the given index. getItemId: returns the row’s id. getView: returns a View object that displays the data at the specified position. 1.5) There are two major components which must be added to this code: the Layout inflater and a collection object to store the items (or it can be a Cursor, if the values come from a database). The LayoutInflater object will act as the bridge between your layout’s xml code and the View objects. The collection (for this example it is an ArrayList) stores all the items that will be added to the list view. 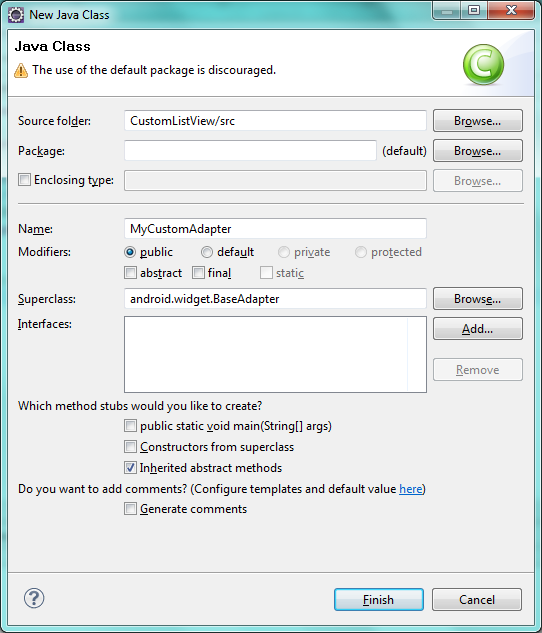 During the instantiation of the MyCustomAdapter object, the context’s inflater will be referenced and the data to be displayed will be passed as input. 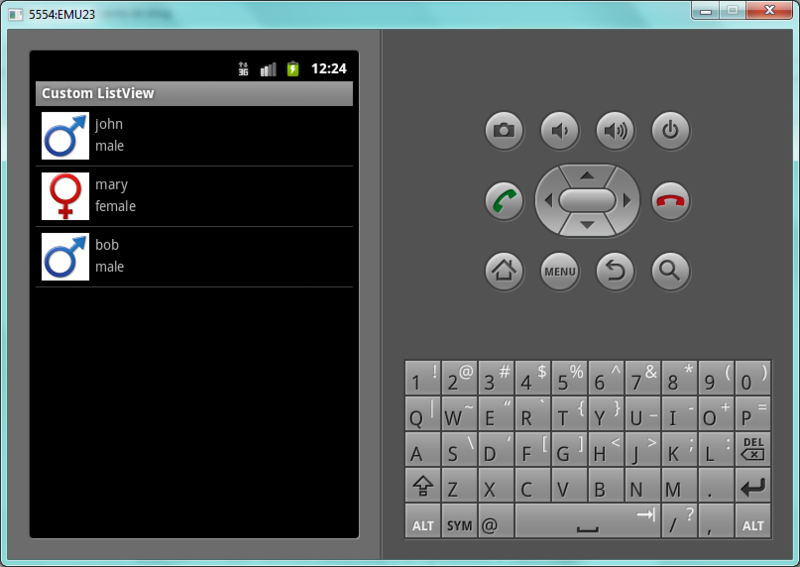 For this example, I will be passing a List of User objects as input. This class will be defined later. This code is straightforward. The returned values are based on the List object received as input. The first method returns the size of this object; the getItem method returns the object stored at a given index. Finally, the getItemId method returns the same value that is received as input (this is the row that was clicked). //if View exists, then reuse... else create a new object. //if gender is male, then use 'male' icon. Otherwise, female. //set 'name' in line 1. //set 'gender' in line 2. The method receives as input a View object; if it is already instantiated, then it is reused. Otherwise, a new View object is declared. Two images can be displayed, and it will depend on the user’s gender. This entry was posted on Saturday, March 3rd, 2012 at 10:38 pm	and tagged with adapter, android, custom, image, listview, multiple rows and posted in Android. You can follow any responses to this entry through the RSS 2.0 feed. thank you for your example, great explanation!